Many of the names in Beckett's play can be seen has having hidden meanings. 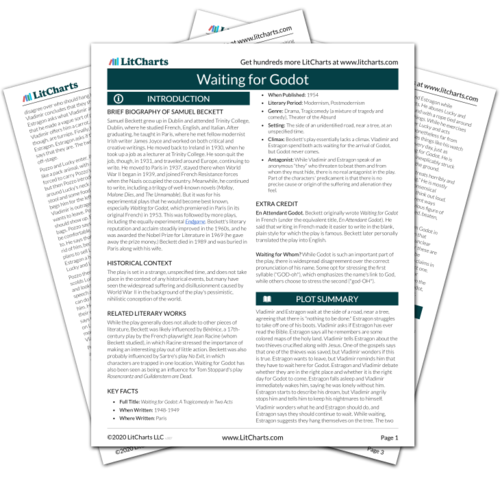 The most important example is Godot, whose name evokes similarity to God for many readers. Along this reading, Godot symbolizes the salvation that religion promises, but which never comes (just as Godot never actually comes to Vladimir and Estragon). But the similarity between "Godot" and "God" could also be a game Beckett is playing with his audience and readers, a kind of red herring that actually imparts no important information. This would be in line with other character names: Estragon means "tarragon" in French, for example, while Pozzo is Italian for a water well, but these meanings hold little to no significance for those characters. And Lucky's name is anything but fitting, as he is the character who unluckily suffers the most onstage. In the end, Beckett's character names suggest the possibility of meaning but fail to deliver on this promise, just as Godot promises to save Vladimir and Estragon but never shows up. As further examples of the nihilist worldview that pervades Waiting for Godot, the play's character names may be significant precisely for being insignificant, meaningful in that they mean nothing. Fredericksen, Erik. "Waiting for Godot Symbols: Names." LitCharts. LitCharts LLC, 15 Dec 2013. Web. 21 Apr 2019. Fredericksen, Erik. "Waiting for Godot Symbols: Names." LitCharts LLC, December 15, 2013. Retrieved April 21, 2019. https://www.litcharts.com/lit/waiting-for-godot/symbols/names.